Lemurian Seed Crystals have horizontal striations on one or more sides. They are found in the Sierra Do Cabral mountain in Minas Gerais, Brazil. Some, but not all, carry a pink to reddish glow. THE BELIEF: Lemuria was a peaceful and highly developed spiritual civilization believed to exist on earth over 12 million years ago. During the last days of Lemuria, it was decided to plant seed crystals programmed to transmit a message of oneness. Having seeded the crystals, the Lemurians, it is believed, left this planet for other star systems. Others went into inner earth (while maintaining telepathic connection with those in other parts of the galaxy), where they continue to care for the earth and the seed crystals now surfacing. You can read more about Lemurian Crystals here. 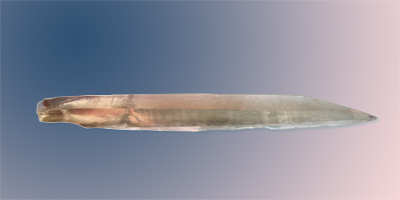 THE CRYSTAL: Lemurian crystals are all wands and as such, conduct, amplify, and focus the Universal Life Force, augmenting the healing power of the healer. Lemurian Seed Crystal Wands are specifically used in spiritual healing when the entire organism is out of balance with itself. They are used to bring a sense of oneness to a person suffering from feelings of disjointedness or detachment. When life seems to be swirling around someone, and they seem to be lost in the whirlwind, use a Lemurian Seed Crystal in the healing process. In divination wands are used in specialized efforts where great precision is needed. Lemurian Seed Crystals are quite effective in divination efforts when the goal is to determine a yes or no answer to specific questions related to relationships. To use one, bury the crystal in a shallow bowl filled with white sand. Place the bowl in contact with the Earth. Over the course of several hours randomly rotate the bowl without thought. With a compass mark the location of North and South. Carefully brush away the top layer of sand until the Lemurian Seed crystal is visible. If it points towards the North, the crystal is indicating that the relationship is aligned with the natural earth and indicates a positive response to the question. If it points to the South, the response is negative. If the wand points primarily East or West, the answer is unclear. Lepidocrocite Quartz (Red Fire Quartz) Quartz with inclusions of Lepidocrocite. Usually called Red Fire Quartz, but occasionally incorrectly marketed as Strawberry Quartz. True Strawberry Quartz has hematite inclusions and a marked different appearance. Lepidocrocite Quartz is a powerful stone for enhancing one's emphatic connection to others. Use it particularly with a lover to assure deep communication and love. This stone will open someone's heart. Library quartz crystals have irregular formations of slightly raised flat crystals attached to the sides and faces. The formations look like books. Library crystals are quite different from other crystals. Where many crystals are used to bring the wisdom of other ages to us, or to contact beings of higher energy planes, Library crystals are used by individuals to hold their wisdom, understandings, and knowledge. Library crystals are your storehouse. Use them to pass on your unique views, your personal understands of the cosmos, and your personal wisdom. 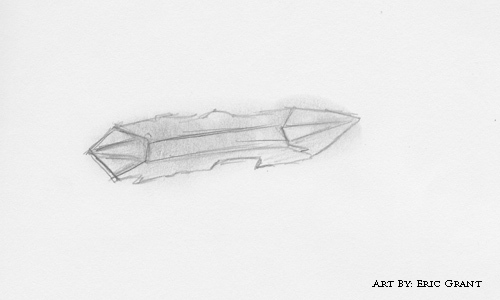 The crystal will hold this knowledge and make it available to future generations. When using a Library crystal, hold it in your hand while you reflect on the important lessons you have learned in your life. You will find that eventually the crystal becomes a part of your being and existence. Some users report that they gain deeper understanding when they interact with their Library. A Library crystal should be carefully protected, and be passed to a descendant later in life. A Life Path crystal is one that is long and thin and one that is clear with one or more absolutely smooth sides. Life Paths are used as individual personal talismans. They are meant to accompany you on your journey through life. They are companion crystals. Lift Path Crystals are solace, joy, excitement, and love. They are a smooth landing in disappointment, and the rapid, quickening joy of achievement. Most crystals have specific powers and energy and specific uses. Life Paths are not specific. They are simply there with you, channeling the Life Force to you and smoothing your path. Find one. Keep it with you. 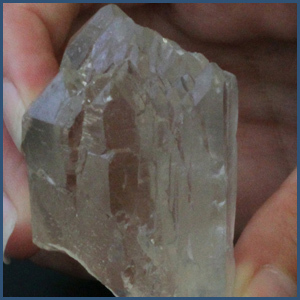 A Lightbrary is a clear Cathedral Quartz Formation. Lightbrary crystals contain the parts of the Akashic Record that explain the concepts of light energy, light beings, and inter dimensional communication channels. However, like all Cathedral quartz they are impersonal teaching crystals that can be accessed by careful study. 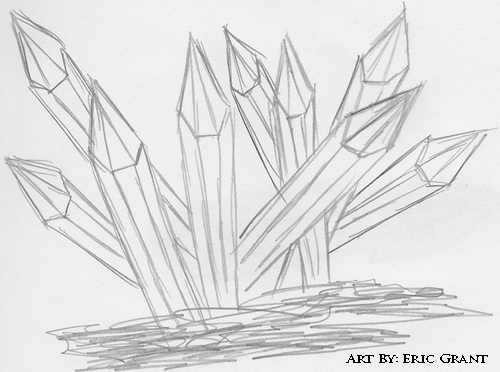 These crystals can seem uncommonly inert and lifeless when first encountered. However with familiarity and careful study, they warm and seem to be filled with a variety of mystic colors, mostly in the red to violet part of the spectrum. If you seek a deep understanding of light energy, and how beings of different spiritual planes interact and coexist in this universe, these crystals may have the answers you seek. Again, like all Cathedral Quartz, these crystals are for use by dedicated seekers of Universal Truth. They are worth whatever their price, if used conscientiously. 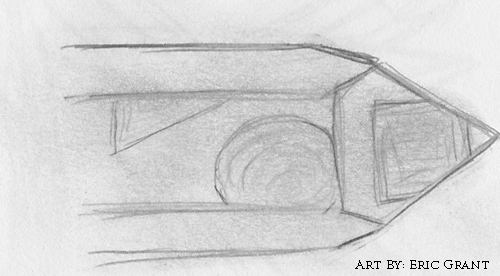 A Lineated Crystal contains a parallel elevated or sunken rectilinear portion of another crystal. Lineated crystals are almost always used as gifts to loved ones. They present a simple message: take a part of me with you – for you are a part of my life too. When giving a Lineated crystal, assure you accompany it with a heartfelt personal message of friendship and love. When receiving such a crystal place it in your home in a place of honor. Lithium Quartz is pink/purple translucent to opaque quartz that may contain lithium-based minerals such as Lepidolite causing the color. The primary energy of Lithium Quartz comes from the inclusions of Lepidolite, a mineral that contains Lithium. Lepidolite is a Guardian amulet of great value. This crystal with its pink ray of influence is used to guard young love from heartbreak. It is used as a personal talisman. If you are in love, and want to stay that way, carry a Lithium quartz crystal or better yet, wear it as a pendant or necklace. Be sure you focus your attention on it daily and it will protect and guard your love. 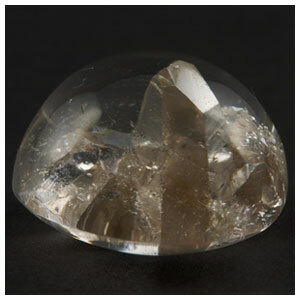 Lithium Quartz is reported to be a very gentle yet powerful healing stone. It is a stone of inner peace that channels the Universal Life Force to quiet mood swings and emotional imbalances. It has been reported to significantly reduce stress, soothe after stressful events, and to induce deep relaxation. Use Lithium Quartz to establish a desirable meditation state when you need to meditate to calm and regain your equilibrium. and A powerful, yet gentle healing stone, Lithium Quartz brings inner peace and stress release -- balancing mood swings and quieting mental agitation. Little Falls Crystal See Herkimer Diamond. The clear quartz crystals offer us the balance and strength of the Universal Life Force with an emphasis on the direct, clear, and outgoing strength of the Yang element. A Manifestation is a crystal containing another eye-visible crystal completely within it. Manifestation Crystals are truly rare, wondrous crystals that are one of nature's truest gifts. They should be actively sought out and used constantly as Manifests are the crystals of Inner Joy. They give you the understanding of your youthful optimistic outlook. The inner crystal is older, but it is now contained within the younger, larger crystal. This is the opposite of the normal young within the body of the older mother. This crystal gives you the Yin power to submerge your actual self in the childlike wonder you once possessed. See the world with childlike joy and enthusiasm with this special crystal - you will amaze yourself with its power. Master Matrix Crystals contain external etchings and/or inclusions and fractures that depict a circle, a square, a triangle. The circle is the most uncommon shape to find, and a Master Matrix with a clear, well formed circular inclusion or etching is most valuable. Master Matrix are used to recharge and realign others crystals that may have been damaged, misused, or mishandled to the point that their power and energy is no longer pure and clean. To use a Master Matrix crystal, place it in pure water with the crystal to be realigned and recharged. Align the crystals with the magnetic lines of power of the planet Earth by using a compass to put the long axis of the crystal pointing to north or south. Leave the crystals exposed to a full moon for at least 4 hours. Store Master Matrix crystals in a dark, secure location. Do not handle these or use them for any other purpose. Master Programmer See Master Matrix above. Mother and Child See Dolphin. Mules Foot See Grounding Crystal. A Muse is a cluster of nine similar-sized crystals. The Muse is quite the most extraordinary meditation crystal. It is the premier Quartz Cluster of Inspiration. These crystals are also the most powerful Cluster for a Specimen Talisman when the need is to bring inspiration and creativity into a room or location. Just being near one of these clusters will bring you new ideas, and a seemingly endless stream of ideas and concepts. Painters, writers, designers, and anyone who uses their mind and body for creative purposes will benefit from the ability of the Muse Crystal to focus and amplify the natural creative powers of the Universal Life Force. Mythic Crystals are opaque milky quartz double-terminated crystals. Mythic Crystals are Double Terminated Female Crystals and as such bring us the power and energy of both types. They are highly charged with the Yin aspect of the Universal Life Force and have the ability to enhance that element of our personal power. These are used as meditation crystals, divination crystals, and personal talismans specifically for efforts directed at enhancing our abilities to draw on the Yin element of the Universal Life Force. They are used in meditation to connect to the spiritual world. As divination crystals, they are used to connect the past with the future, drawing from the past to see into the future. Multi - Terminated See Extra Terminated.